As artificial intelligence (AI) creeps steadily into everyday life, a growing number of marketers are using it to enhance their campaigns and provide better experiences for customers. Across industries, AI is helping marketers to make sense of large amounts of data, learn more about markets and customers, generate leads, optimize campaigns and streamline operations. 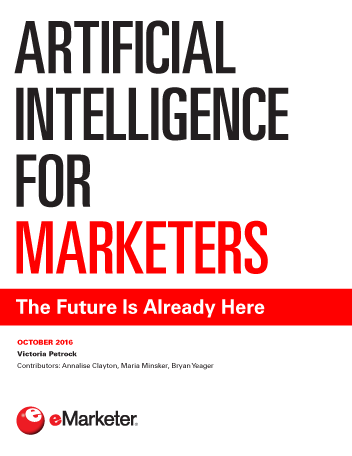 AI for marketing and advertising is still in the early stages, but its use is growing quickly. Faster and more affordable processing power, cloud computing platforms, big data and unprecedented connectivity are all helping drive more widespread adoption. Marketers across all industries are experimenting with ways to put AI to use. Top applications include business intelligence, customer acquisition, programmatic advertising, campaign optimization and multichannel communication. Some AI players—including top tech companies, advertising agencies and marketing-focused startups—are working on projects and collaborations that will bring AI to marketing and advertising in a more coordinated way. IBM’s Watson platform is a leading player in these efforts. Many marketers fear that AI adoption will result in job losses, though it’s too early to know. Some experts believe the new technologies will actually free some employees to do more valuable work. "Businesspeople, including marketers, are turning to AI to accomplish a variety of goals. These include predicting future activity, automating manual and repetitive tasks, monitoring business health and improving communications with customers."